Like last year, between Christmas and New Year´s Eve, my girlfriend and me did some livin´, lovin´and eatin´ in Stockholm at Snowball, a six-day Swing dance event. Six days of dancing might sound like a bit long, but time went by real quick with meeting people, hanging out and going to the parties. Of course I also found time to go search for records. Initially I had intended to visit some record shops I had picked out on the Internet, but while I was on my way through the freezing cold outside, I passed a thrift store, took a quick peek and and decided on the spot, that my search was over. For 10 kronor each I bought about forty 45s in that little thrift store. Among them a whole bunch of EPs issued on the Swedish Gala label. Gala was a club label like Bertelsmann and Concert Hall , where you paid a fixed amount of money to receive random pop records. It wasn´t possible to listen to the records in the store, but I knew I wanted this one, because I already have another excellent EP by the Peters Sisters on the French Vogue label in my collection. Anne, Virginia and Mattye hail from Santa Monica, California, where they first sang together in churches, local amateur shows and social functions. Then in 1937, while making a hopeful, though unpaid, appearance at a Hollywood night club, they were spotted by comedian Eddie Cantor who immediately signed them up to appear in the film “Ali Baba goes to Town”. 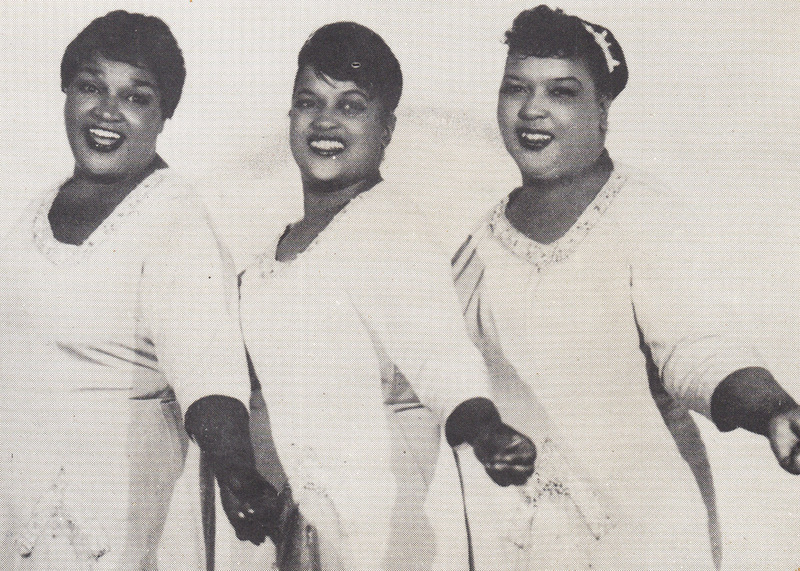 These were the legendary years of New York´s Cotton Club, and the Peters Sisters found their way there to sing with “Duke Ellington and his Famous Orchestra”. The girls first came to England in 1938 and toured for a year with a show called “Hawaiian Paradise”. Also on the bill were Max Wall and Ted Ray. Then came the war years and it was not until 1950 that the Peters Sisters fulfilled a long-standing engagement to appear at the Folies Bergère in Paris. Tours of North and South America followed. In 1959 they appeared at the London Palladium with May Bygraves and recently were seen by millions of BBC-TV viewers in the Billy Cotton Band Show. In private life Anne and Virginia are married to Frenchmen and live in Geneva and Paris, while Mattye´s husband is a Dane and their home is in Copenhagen. This is the first Pop Parade release by these bumper-bundle close-harmonists who leave us in no doubt that they are in fact… the three Peters Sisters! 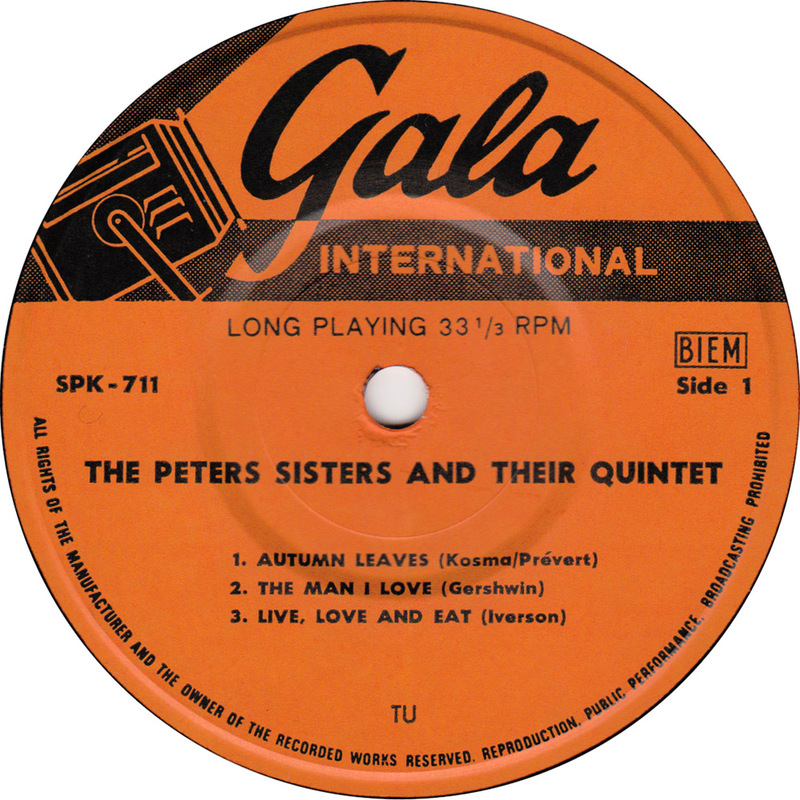 Unfortunately of all of the songs the Peters Sisters recorded in three decades only a small portion has been reissued on two CDs. 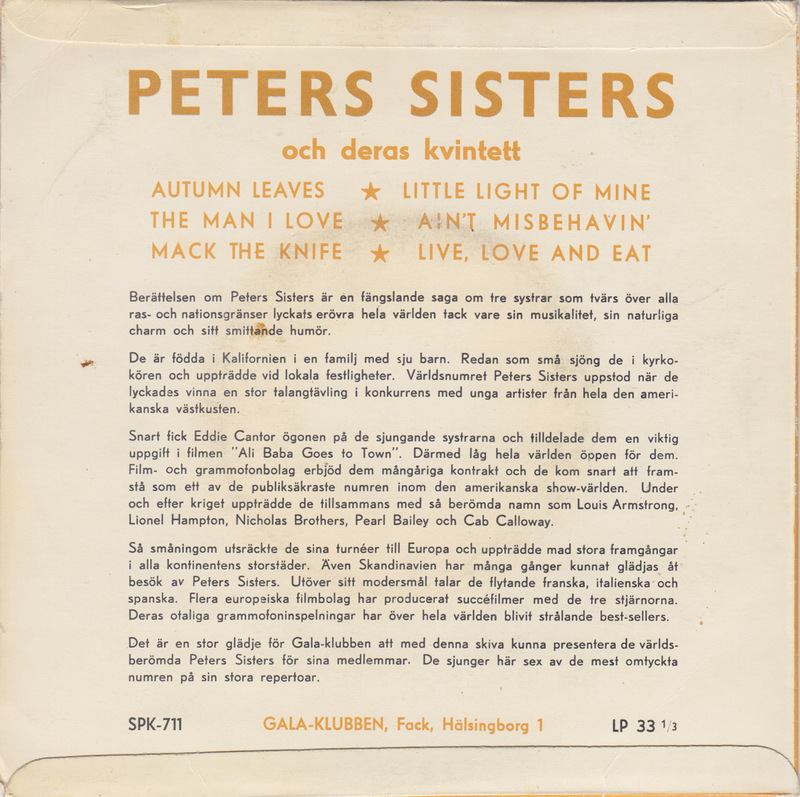 “The Very Best of the Peters Sisters” CD focuses on their 50s and 60s material. It leaves out all of the songs they recorded in the 1930s and 40s like Everybody Step, The Highland Swing and their version of Ella Fitzgerald´s A-Tisket A-Tasket. Despite the title, the French CD “Toutes Nos Chansons” is neither a complete retrospective of all of their work and consists mostly of the songs they sang in French. The four other songs on this Swedish EP were also released on the British Pop Parade EP in 1962 and on the Jazztone label and can be found on the “Very Best of” CD. 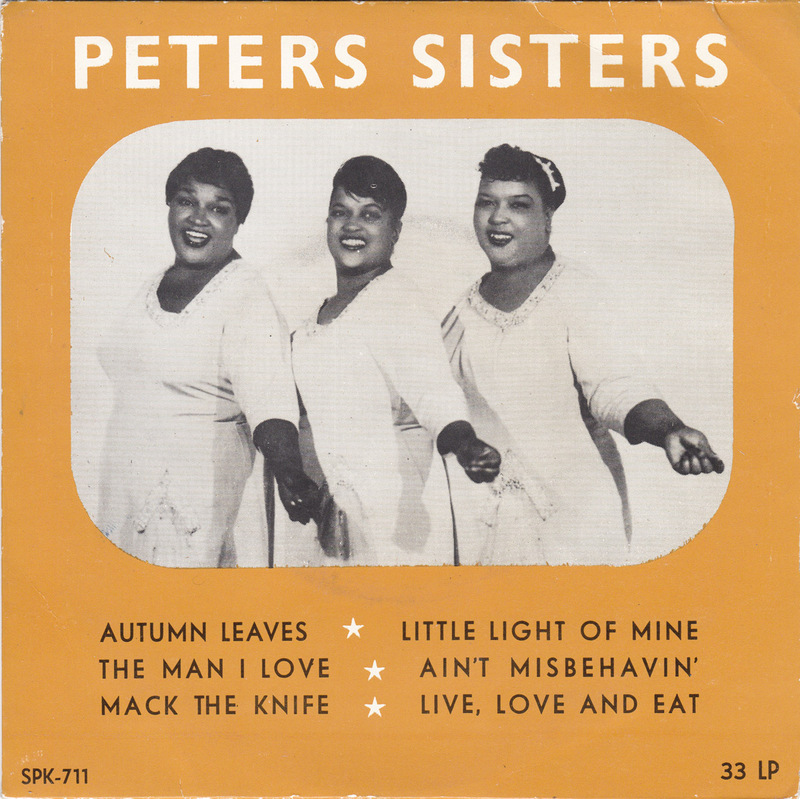 The Peters Sisters´version of Ain´t Misbehavin´ and their own Live, Love and Eat have never been reissued. It´s wintertime, the time of the year when it´s especially nice to enjoy livin´, lovin´and eatin´ at home.